We live at a time of transition between two worlds — the disconnected, analog past and the wired, digital future. Nowhere is this transition more apparent than in higher education, where cutting-edge technologies regularly mix side by side with centuries-old traditions. Openness is about overcoming barriers and paradigms of the past to unleash the transformative power of freely and fully using information in today’s world. Considerable strides have already been made toward Open Access in the realm of scholarly and scientific research, with millions of papers now available online through Open Access journals or institutional repositories, and hundreds of institutions adopting self-archiving policies. The movement for open education is following suit, expanding the use of Open Educational Resources (OER) to hundreds of thousands of students and saving tens of millions dollars on textbooks. Open Access and OER are essential building blocks for a more open future, and they are stronger together. Nicole’s talk will connect the dots between the areas of overlap and common lessons learned from the movements for Open Access and Open Educational Resources, as well as identify strategies for moving toward a more open future in higher education. Nicole Allen is the Director of Open Education at the Scholarly Publishing and Academic Resources Coalition (SPARC). She also currently chairs the Steering Committee of the Open Policy Network. Her work focuses on public policy and engaging and supporting the library community. She worked for seven years at the Student Public Interest Research Groups, organizing grass roots campaigns around issues related to open educational resources. This included a cross-country tour dubbed “The Textbook Rebellion,” resulting in 3,000 university professors signing a commitment to consider adopting open textbooks. Nicole is regarded as one of the leading experts on college textbooks costs. Nicole splits her time between her home in Providence, Rhode Island and SPARC’s headquarters in Washington D.C.
As announced in August, UBC’s new campus-wide Pay for Print service has rolled out at UBC Library branches, replacing existing Library pay-for-printing solutions. Pay for Print is a service that allows students, faculty, staff and visitors at UBC to print, copy and scan documents efficiently via their UBCcards. This service enables a uniform payment mechanism and accounting service to allow departments to offer students, faculty and staff access to printing services with their UBCcard. The deadline for refunds is October 31. 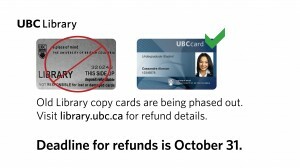 Please contact lib-oldcopycards@lists.ubc.ca with any questions about old Library copy card refunds. For more information on the Pay for Print process, visit the Library’s Print, Copy, Scan website. Dr. Keren Dali – “The Whole of Life,” or Why Teach and Study Reading in LIS Programs? October 14th, 2014 by allancho | Comments Off on Dr. Keren Dali – “The Whole of Life,” or Why Teach and Study Reading in LIS Programs? Please join us at the iSchool for the upcoming talk, “The Whole of Life,” or Why Teach and Study Reading in LIS Programs? on Tuesday, October 21st, 2014 with Dr. Keren Dali, Assistant Professor, Faculty of Information & Media Studies, Western University. In her Summoned by Books, F. C. Sayers wrote: “A love of reading encompasses the whole of life: information, knowledge, insight and understanding, pleasure; the power to think, to select, to act, to create – all of these are inherent in a love of reading.” From the vantage point of 21st century LIS, this statement situates the study of reading and the practice of readers’ advisory (RA) as an integral part of information literacy, a staple of libraries’ engagement with user communities, and an essential component of LIS education. Yet, in reality, RA work in libraries is often limited to traditional reading advice, confined to public libraries, and more concerned with guides and displays than with the active engagement of readers. Similarly, courses on reading in LIS programs often focus on genre conventions and RA resources. Both the practice and teaching of RA have been governed by experience-based approaches rather than systematic empirical observations. These no longer suffice. Guiding approaches have to become evidence-based rather than intuitive and rest on rigorous research and interdisciplinary scholarship. Dr. Keren Dali discusses changes in reading-related library work and LIS education based on her published research and current projects. October 21st, 2014, 12:00-1:00 pm in the Dodson Room (Rm #302), Irving K. Barber Learning Centre. provided. Posted in Events, Featured, Programs | Comments Off on Dr. Keren Dali – “The Whole of Life,” or Why Teach and Study Reading in LIS Programs? October 14th, 2014 by lizbsimmons | Comments Off on What is Open Access? Posted in Open Access, OpenUBC, Scholarly Communications News | Comments Off on What is Open Access?